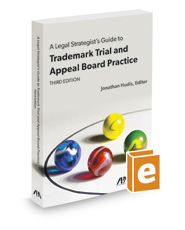 Published by the American Bar Association (ABA), A Legal Strategist's Guide to Trademark Trial and Appeal Board Practice provides invaluable analysis and practical insights from an array of experienced attorneys who practice before the U.S. Trademark Trial and Appeal Board. This first-of-its-kind treatment considers all relevant caselaw, including an informed discussion about the ramifications of the recent U.S. Supreme Court's decision in B&B Hardware, Inc. v. Hargis Industries, Inc. Every chapter clearly describes and analyzes a separate facet of Board practice and concludes with a valuable checklist of items for practitioners to bear in mind during each stage of a Board proceeding.